ZF is the abbreviation for Zahnradfabrik Friedrichshafen. Original equipment clutch assembly (Valeo) from Carolina Clutch (phone # 888 462-2739). Note: Clutch Assemblies by Centerforce or McLeod Industries build upon Valeo core components. wide-open-throttle runs uphill in reverse! Another test involved 200,000 highway and proving ground test miles, while still another test involved about 80 hours of high-speed testing on various racetracks and at the GM Desert Proving Ground in Mesa, Ariz. This was followed up by a thousand miles of testing on the high banks at Talladega Super Speedway in Alabama. TRANSMISSION: The ZFS6-40 is a constant-mesh parallel-axial fully synchronized transmission. The design incorporates an input/main shaft, a countershaft, and the output/main shaft. The input shaft and main shaft are located on the same axis. The counter shaft is on a parallel axis with the main shaft at a 95mm separation distance. The 1st, 2nd and 3rd idler gears are assembled on the main shaft. 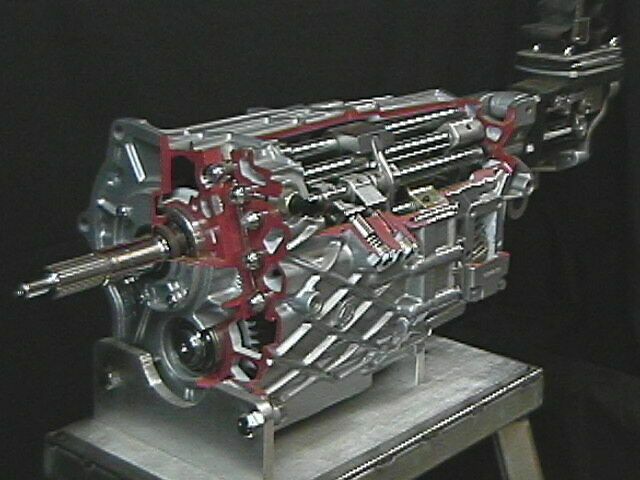 4th gear is part of the input shaft and is the driving gear which constantly drives the countershaft. The 5th and 6th idler gears are assembled on the countershaft. All forward and reverse gears are fully synchronized. 1st and 2nd have the same type of dual cone clutch synchronizers. 3rd through 6th have the same type of single cone clutch synchronizers. Reverse has a smaller single cone clutch synchronizer than 3rd through 6th. Synchronizer Mechanism (3rd Gear Shown) Unlike a dog clutch, a cone clutch can progressively increase or decrease its level of torque transfer. Motion is transferred through the shift linkage to the shift fork and then to the sliding collar (F) of the synchronizer hub (D). Synchronizer hubs are located aft of the reverse idler gear, between 1st and 2nd, between 3rd and 4th, and between 5th and 6th idler gears. As the sliding collar (F) starts to move, pressure pieces (H) momentarily exert pressure on the synchronizer ring (A) forcing it onto the conical binding surface attached to the idler gear. This momentary binding force causes the idler gear to synchronize its rotational speed with the planetary shaft beneath it. As the sliding collar (F) continues to move toward the idler gear, pressure is released off of the binding ring while both sets of dog teeth self align and interlock with each other. Proper sliding collar-to-idler gear dog tooth alignment prior to interlock engagement is provided by 3 evenly spaced sets of 5 dog teeth which protrude further out from the remaining dog teeth. These are preemptive dog teeth which are located only on the sliding collars. The design of the dog teeth provide a positive lock-up at engagement disallowing disengagement until the sliding sleeve is retracted by the gear shifting system. Power loading through the engagement gear further enforces this self-locking effect. Shifter Assembly - The shifter selection-rod détente system is responsible for the tactile sensation for most of the lateral shifter movement and some of the fore-aft movement. The remaining fore-aft tactile sensation is induced by the détentes on the shift rails. A series of locking pins and a ball restrictor (not shown) shift selection to allow for only one shift rail to actuate at a time. detent spring expansion plugs. Loctite 609 Retaining Compound will seal them nicely. DRIVELINE: Torque flows from the engine to the transmission input shaft driving-gear at the front of the gearbox, through the driving gear down to the countershaft, through the driven gears up to the main/output shaft at the rear of the gearbox and down the drive shaft to the rear axle. Fourth has a 1:1 direct torque flow from the input shaft to the output shaft. Driveline Support Beam, Differential Carrier and Cover Beam - are responsible torsion rigidity of torque delivery aft of the transmission, isolating the counter force from twisting the chassis/suspension planes. We at ZR51 Performance have found that the quality or degree of joint compliancy at both ends of the Support Beam directly affect the quality and level of vehicle acceleration handling. For example, a conventionally set up C4 driveline allows for a slight amount of flex to occur in the beam ends right around the fastener bolt and nut areas. This slight amount of flex at the beam contact planes propagates an undesirable effect know as driveline lateral deflection. The most prevalent affect of this phenomenon is the tendency of the rear end wanting to kick out to the right when aggressively shifting at higher RPMs. By using ZR51 Performance C4 Beam Plates, your C4 Corvette will benefit from higher levels of predictability and smoothness of directional tracking with respect to more intense levels of acceleration handling. These C4 Beam Plates are highly effective light weight bolt-on reinforcement devices that minimize lateral deflection of the driveline under extreme torque delivery conditions. They also act as convenience devices for easier removal and installation of the Driveline Support Beam. The top-side wrench free design will put an end to those "I got hit in the face again with the 18 or 21 mm wrench" Blues. Please take a moment to review the C4 Beam Plates Customer Feedback section or ask someone who has already installed them and tested them out. VEHICLE SPEED INDICATION SYSTEM (VSIS) - The C4 Corvette VSIS uses a pulse-signal-reference generated from the Vehicle Speed Sensor (VSS). The VSS, when equipped with a 15 tooth (T) drive gear (on output shaft) and 42T driven gear turning the VSS combined with a 3.45:1 differential ration, produces 4000 pulses per mile traveled. The VSIS is calibrated to 4000 pulses equaling one mile. When the differential (final drive) ratio changes, so does the pulses generated over each mile. To correctly recalibrate the VSIS signal pulse rate back to 4K/mile either the drive and/or driven VSS gear(s) must be changed or a black box Electronic Ratio Adapter (ERA) installed. Both cost around $140. LOOK OUT FOR TROUBLE: The preemptive dog teeth are most susceptible to damage when the clutch hydraulic system becomes degraded. The sensation of notch shifting is more prevalent when the sliding collar's preemptive dogteeth become worn or badly deformed. Advanced stages of preemptive dog tooth wear may result in gear engagement difficulty due to metal burrs restricting normal movement of the sliding collar. This condition can also cause partial engagement of the dog teeth resulting in unexpected gear disengagement. In any such circumstance, discontinue use of the problematic gear until necessary repairs can be performed. This may save lots of money in additional parts when repaired. Wide Open Throttle (WOT) position. component due to out-of-parameter (delta) merging speeds (rotational). 1) The clutch hydraulic system is at peak operating condition. 2) Hitting the mark - time line sequence of a clutch cycle. 3) The status of your transmission oil. TRANSMISSION OIL (status) - Vascular flow of oil through the porous Phosphorus-bronze (Pb) material of each synchronizer is essential for effective British Thermal Unit (BTU) heat exchange occurrence. Frequent transmission oil changes will ensure lower Pb particle levels suspended in the oil. The ZF S6-40 6-speed transmission is lubricated by engine type oil. Manufacturer recommendations specify the use of GM P/N 1052931 (5w-30) or BMW P/N 07510009420 (10w-60) oil. Approximate oil capacity of the ZF S6-40 is 2.2 quarts. FYI - the BMW 10w-60 oil is fully-synthetic and is used in the BMW M5 engine. The oil fill/drain plug GM P/N is 10140673. CLUTCH HYDRAULIC SYSTEM (condition) - is made up of a master cylinder hydraulically plumbed to a slave (actuator) cylinder. The hydraulic clutch fluid (GM P/N 12345347) is a Dot3 grade with friction modifiers. Over time this hydroscopic fluid tends to absorb moisture indirectly from the atmosphere. The fluid reservoir features a vented twist-off cap enclosing a drop-in atmospheric moisture barrier type seal. The upside-down top-hat shaped barrier also acts as an atmospheric pressure equalization member responsible for reducing the tendency of gravity induced leakage of fluid from the system. We recommend using Valvoline full-synthetic Dot3 Dot4 Brake fluid over the stock fluid. Clutch hydraulic system problems can be difficult to understand and even more difficult to explain to others. Just remember that the clutch hydraulic system is a simple positive pressure displacement devise. With the pedal all the way up, internal (static) pressure should be zero. As the clutch pedal is pressed in, pressure builds up in the system until the applied force on the pressure plate diaphragm spring(s) exceeds the clamping resistance force of the device. In many problematic cases it is likely that the system is not building as much pressure or delivering as much volume to the slave cylinder as required by the system for complete disengagement of the clutch per clutch pedal stroke. Avoid reporting that you believe that the system seems to be losing pressure during each pedal stroke. What is actually happening is that the system is not building up enough pressure during a given stroke resulting in a less than full cycle to the clutch. Just remember that a loss of pressure implies that a higher pressure has been achieved and then some lost during each clutch pedal cycle. The two failure modes are significantly different and should not be confused with each other. Road TRIP Survival TIP: You can avoid being stranded by a sudden leak in the clutch hydraulic system by using a piece of rubber tubing and a 10mm wrench. The wrench is for moving the ECM out of the way and the tube is for transferring a small portion of brake fluid over to the clutch fluid reservoir. This temporary work-around could save you from major towing or transmission repair bills. A Common Problem with - the clutch hydraulic slave (actuator) cylinder is that they are susceptible to developing a hang up spot between the seal and the bore at the fully extended end of the cylinder's travel range. Recently (June 2006), we discovered that GM and NAPA replacement slave cylinders (TRW manufactured) have been assembled and sold to customers all over the country/world with the piston seal installed backwards. The problem with this condition is that the clutch hydraulic system will bleed out normally but still have a hang up spot present. This condition creates a problematic operational situation in the system where even a full clutch pedal depression will not allow complete disengagement of the clutch for more than just a brief instance when the pedal is depressed and held to the floor. The initial hydraulic fluid surge within the slave cylinder presses the actuation rod far enough for complete disengagement only to spring back slightly when pedal movement is halted in the fully depressed state. The spring back is caused by flex in the slave cylinder seal getting hung up and stretching a bit further only to return to its normal shape when surge pressure subsides. This manufacturer induced fault condition will mislead most technicians into believing that the clutch hydraulic system is operating at an acceptable level. Under these conditions, exactly timed quick shifts will occur fairly smoothly because the brief instance that the slave cylinder bore seal stretches is the same instant that the shift occurs. When the shift sequence is slowed down, the spring back of the slave cylinder occurs before the shift lever actuation causing a not-so-smooth gear engagement event. This causes the synchronizer to work much harder than necessary and is exposes the synchronizers and dogteeth to potential damage especially during higher RPM shifting. The best way to verify the presents of a " hang up" condition in the hydraulic clutch system is to have the vehicle at running temperature, coast down to a full stop until completely stationary and in neutral with the clutch pedal all the way up. Wait for a few seconds then depress the clutch pedal completely to the floor then wait for another 2 seconds before shifting from neutral to either 1st or reverse gear. If there is any resistance at all when actuating the shift lever into either gear from this state, it is likely that some degree of seal hang up is present. Hydraulic clutch systems that have this type of problem can cause the synchronizers to wear much more quickly. A healthy clutch hydraulic system should provide silk-smooth gear engagement during this type of test. Optimize each shift-segment window-of-opportunity by full-cycling the clutch pedal completely to the floor. Utilize the firewall mat for a springboard to literally bounce the clutch pedal back off of. The clutch pedal to firewall mat strike point can easily be protected by laying down a few strips of 2" wide high quality electric tape. While standing and balancing on your right leg, raise your left leg 7" up off the floor. Simultaneously tap the floor with the bottom of your shoe tip and snap your right hand fingers (ring/thumb) so as to make one combined noise between the two. Match'em 30 times in a row, and you're dialed in precision shifting. Shift lever movement should initiate to the next gear at the same time you expect to hear the "thunk" of the clutch pedal tapping the mat. Warning - Shallow clutching is deadly to these transmissions when powershifting. CRYOGENIC TREATMENT: During manufacturing, metal components undergo many processes. One of which is the process of tempering. During the cooling or quenching period of metal treatment is where austenite (solid solution of carbon and iron) which is soft, tough, and ductile, is transformed to martensite, a hard and strong constituent. This process does not convert all of the material because the cooling/quenching session ends at ambient temperature. When steel is cooled to subzero temperatures, the stability of the retained austenite is reduced so that is more readily transformed. The ultimate transformation of austenite to martensite may take place in carbon steel without the aid of subzero treatment, but this natural transformation might require 6 months or longer, whereas by refrigeration this change occurs in a few hours. Cryogenic treatment more closely completes the conversion process of austenite to martensite by cooling the metal to near zero degrees Kelvin. Afterwards, the metal must be tempered by at least 3 cycles from ambient to 300 degrees F. This removes the brittleness from the newly converted martensite. Reduction of flex within the synchronizer rings and other carbon steel components extends the reliability/durability of the overall mechanisms. Send email to billb@zfdoc.com or call Bill Boudreau at (602) 319-6575.